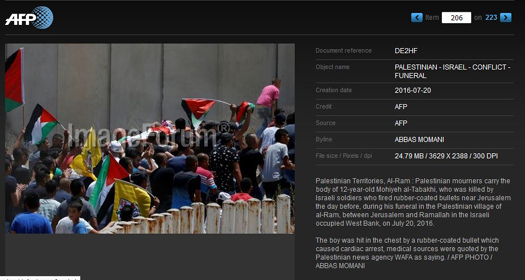 Following communication from CAMERA’s Israel office, Agence France Presse partially fixed captions which parroted a disputed Palestinian claim as fact. As noted yesterday in our Snapshots blog, the July 20 captions stated as fact that Israeli forces fired rubber coated bullets which killed 12-year-old Palestinian Mohiyeh al-Tabakhi a day earlier during clashes in al-Ram near Jerusalem, and ignored the Israeli police statement that the troops did not use live fire. Palestinian Territories, Al-Ram : Palestinian mourners carry the body of 12-year-old Mohiyeh al-Tabakhi, who was killed by Israeli soldiers who fired rubber-coated bullets near Jerusalem the day before, during his funeral in the Palestinian village of al-Ram, between Jerusalem and Ramallah in the Israeli occupied West Bank, on July 20, 2016. Palestinian Territories, Al-Ram : The mother (C) of 12-year-old Palestinian Mohiyeh al-Tabakhi, who was killed by Israeli soldiers who fired rubber-coated bullets near Jerusalem the day before, mourns during his funeral in the Palestinian village of al-Ram, between Jerusalem and Ramallah in the Israeli occupied West Bank, on July 20, 2016. A Palestinian boy was killed by Israeli soldiers who fired rubber-coated bullets near Jerusalem on Tuesday, said the Palestinian health ministry. “Mohiyeh al-Tabakhi, 12, was killed by shots fired by occupation soldiers in the Al-Ram area near Jerusalem,” the ministry said in a statement. The Palestinian suburb in the occupied West Bank near Jerusalem is cut off from the Holy City by the “separation wall” built by Israel. The boy was hit in the chest by a rubber-coated bullet which caused cardiac arrest, medical sources were quoted by the Palestinian news agency WAFA as saying. Israeli police said tear gas grenades and sound bombs had been used against demonstrators in the area. “After being pelted with Molotov cocktails, police used tear gas and stun grenades to disperse the protesters,” police spokeswoman Luba Samri told AFP. In response to correspondence from CAMERA, editors quickly but quietly amended the captions, which no longer state as fact that al-Tabakhi “was killed by Israeli soldiers who fired rubber-coated bullets.” The improved captions available in AFP’s photo archive (screen shots of some examples are below) now attribute that Palestinian claim to the Palestinian health ministry instead of relaying them as fact. Editors, however, did not alert their subscribers to the change by flagging the amended captions as “clarifications.” Over the years, AFP has consistently failed to alert its clients to clarifications and corrections in its photo captions, a practice commendably in place in other photo agencies like Associated Press and Reuters. Palestinian Territories, Al-Ram : Palestinian mourners carry the body of Mohiyeh al-Tabakhi, a 12-year-old boy who according to the Palestinian health ministry was killed by Israeli soldiers who fired rubber-coated bullets near Jerusalem the day before, during his funeral in the Palestinian village of al-Ram, on July 20, 2016. Palestinian Territories, Al-Ram : The mother (C) of Mohiyeh al-Tabakhi, a 12-year-old boy who according to the Palestinian health ministry was killed by Israeli soldiers who fired rubber-coated bullets near Jerusalem the day before, mourns during his funeral in the Palestinian village of al-Ram, on July 20, 2016. For additional AFP corrections prompted by CAMERA, please see here.